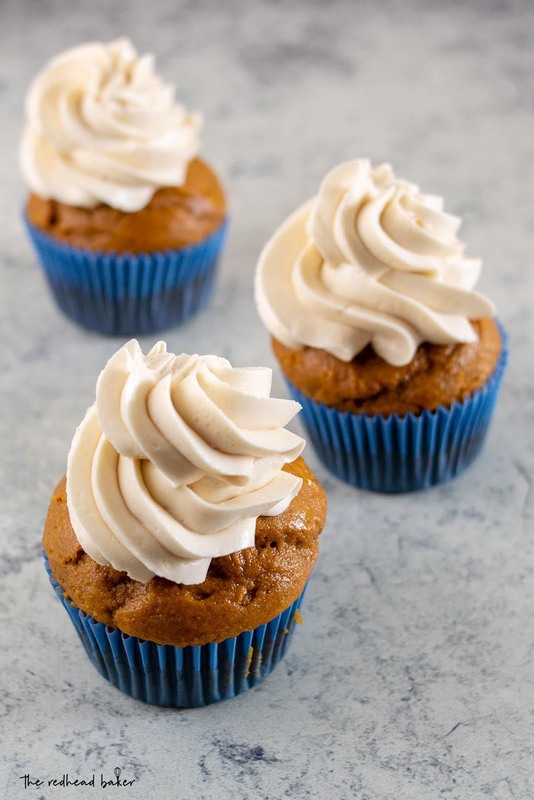 Moist and lightly sweet pumpkin cupcakes are topped with a creamy maple-flavored Swiss meringue buttercream. They’re a quintessential fall dessert! It’s Day 4 of #PumpkinWeek! 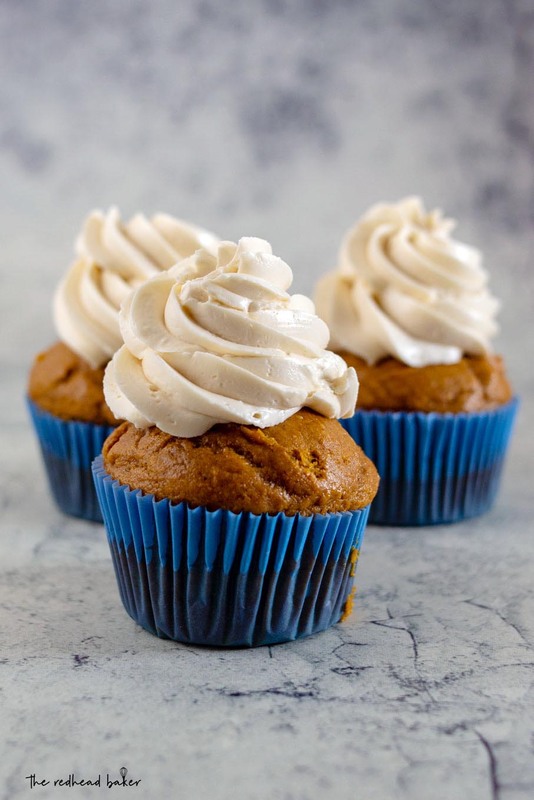 Today I’m sharing pumpkin cupcakes with maple buttercream. I really, really like these cupcakes. They’re light and fluffly, like cupcakes should be. They also not overly sweet. You can make these cupcakes up to two days ahead of time and store them, unfrosted, at room temperature. Cupcakes tend to lose moisture when stored unfrosted in the refrigerator. But let’s talk about my favorite part: the frosting. 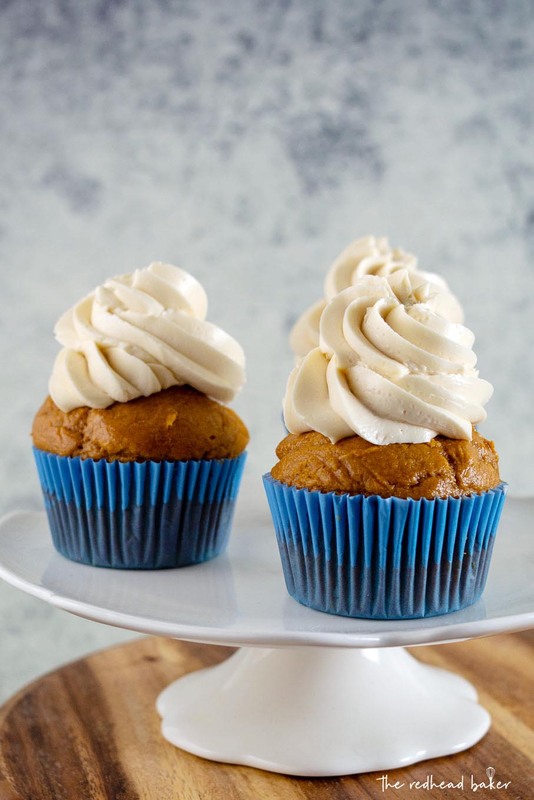 The frosting is a maple-flavored Swiss meringue buttercream. I love the flavor and smooth, creamy texture of this buttercream. Swiss buttercream is also easier to make than French or Italian because it doesn’t involve cooking the sugar into a syrup. Obviously, from the name, this is a meringue-based buttercream, so as with all meringues, you need to ensure you start with a clean, dry bowl. Meringue will not whip up if it comes into contact with even a trace of fat. Before I start any meringue, I wash my bowl with hot, soapy water, dry it thoroughly, then wipe it down with a paper towel dampened with white vinegar. Some tips for Swiss buttercream success: once you’ve whipped your egg white/sugar mixture to soft peaks, make sure they are room temperature before starting to add the butter. Warm meringue will melt the butter. It won’t ruin your buttercream, but it will make the process take longer. If, once you’ve added all the butter, your mixture looks separated, watery, or curdled, just keep whipping on medium-high speed. Walk away for about five minutes. You’ll probably come back to luxuriously creamy buttercream. If not, chill your bowl for about 10 minutes, then continue whipping. Preheat oven to 350 degrees and line two muffin tins with 18 paper liners. Set aside. In a mixing bowl, combine the flour, baking powder, baking soda, salt, and spices. Set aside. In another mixing bowl, whisk together the oil, eggs, brown sugar, pumpkin puree and vanilla. Pour the wet ingredients over the dry ingredients and stir together just until combined (the batter will be very thick). Use a large scoop to portion the batter evenly into the prepared baking tins. Bake for 20 to 22 minutes, or until a toothpick inserted in the center of a cupcake comes out clean. Cool in the pan for 5 minutes, then remove to a wire cooling rack to cool completely. Bring about an inch of water in a deep saucepan to a boil. In the bowl of a stand mixer, combine the egg whites and sugar. Place the mixing bowl over the saucepan of boiling water (don't let the mixing bowl touch the boiling water) and whisk constantly until the sugar dissolves. Remove the mixing bowl from the double boiler and place on the stand mixer with the whip attachment. Beat at medium-high speed until medium-soft peaks form (tips form but the tops fall over when the beater is raised). If the meringue reaches this point, and the bottom of the mixing bowl still feels hot the touch, turn the speed to medium-low until the bottom of the bowl feels barely warm to the touch. Switch to the paddle attachment. Begin to add the butter while mixing on low speed, a tablespoon at a time at first, letting the butter be incorporated before adding more. Be patient, this will take some time. Increase the mixer speed to medium and beat until the buttercream becomes fluffy. Microwave the maple syrup in 30-second bursts until it is hot but not boiling. 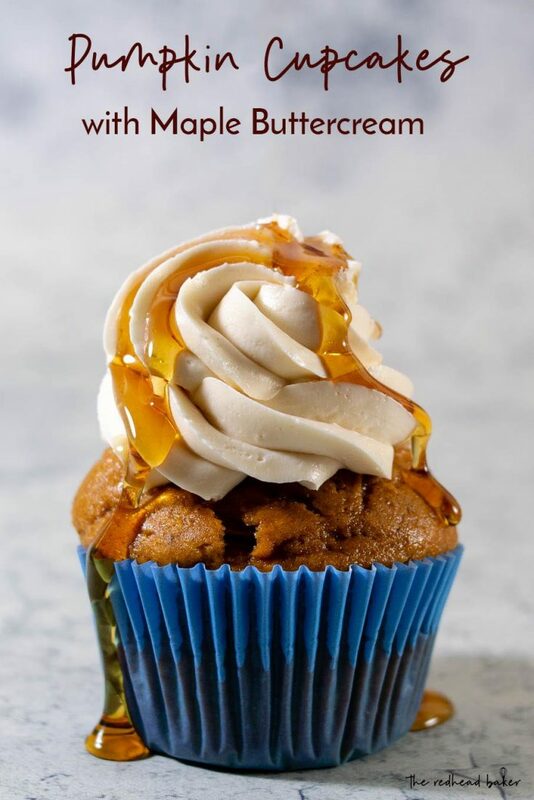 Slowly drizzle the maple syrup into the buttercream and mix on low speed until it is fully incorporated. Beat another 3 to 5 minutes or until the frosting is fluffy and spreadable. Fit a piping bag with a large open star tip. Fill halfway with buttercream. Pipe a generous swirl of frosting on top of each cooled cupcake. 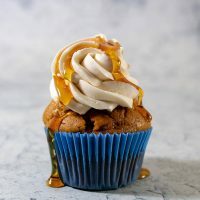 Love the photo with the drizzle of maple syrup. Made my tummy grumble. Oh my goodness! These cupcakes look amazing!